It may be not a good way of describing myself, but I am a quite difficult person. I sometimes don’t even understand myself, and can’t expect what I will do in future. I may do something that I never thought of doing it, out of sudden. I like it when someone tells me “Ume, you are strange.”. I like being different from others..
My mum is blood type A, and my dad is B. I have a bit of both of them, eg I think the way like my mum does, but I do things like my dad does. Personally I like to be unique, and yes I quite like my character. I really think that I’m little strange and unique from other people. 😀 … To think about it, I’ve never met anyone with the blood type AB in Australia. Pisces: Two fishes are tied together. One is trying to swim toward the surface, and the another one is trying to swim toward the bottom of the sea. Affected by the water flow direction, they can be moved toward the surface or bottom easily. 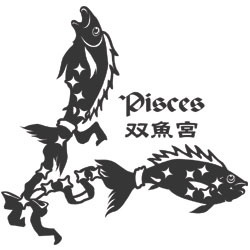 In the real life, Pisces can be easily affected by the environment and other people around. And, it’s said that Pisces people have two faces as there’re always two fishes inside them. I’m writing this because I found it’s interesting. Actually I’ve never met anyone who is Pisces and the blood type is AB. Anyone?? Grate daikon radish. Drain well. Keep in the fridge until needed. Chop onion. Heat 1 tsp of butter in a frying pan, and saute the onion until almost transparent. Transfer the onion to a bowl, and let it cool down. Heat 1 tbs of butter in a frying pan and saute halved mushroom. Season well. Remove from the pan and set aside. Heat the same pan and sear patties both side. Turn down the heat and cook through. Placing a lid helps faster cooking and keeps the moisture. Place soy sauce, lemon juice and water in a small sauce pan and bring to simmer. 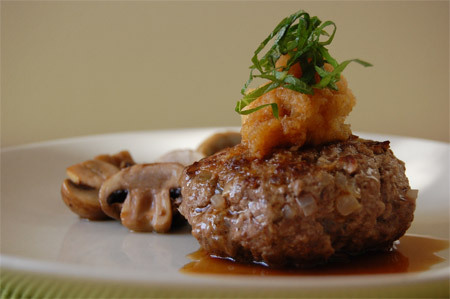 Arrange patties on serving plates, top with grated daikon radish and shredded shiso leaves, and drizzle the tangy sauce over. Accompany with sauteed mushroom. 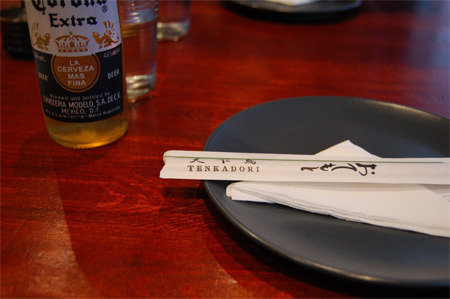 Zensaki in St Georges Tce opened its second shop in Barrack street, where Mr Samurai was before it closed its door. 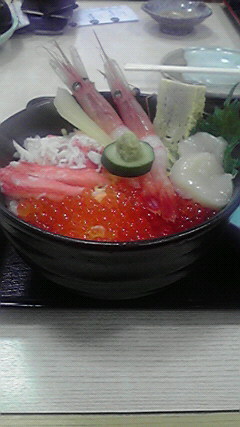 This Zensaki offers some of Japanese typical menu such as donburi and sushi , and also some noodle menus. At Zensaki, they cook the soup broth for over 24 hours for deeper and developed flavor. They promised to use no preservatives and msg on all the dishes. 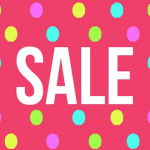 At the moment Zensaki at Barrack is doing a special campaign – $6.00 for teriyaki chicken, teriyaki fish or teriyaki tofu for a limited time only. Normal price for those dishes is $8.50. I think their price range is pretty reasonable. 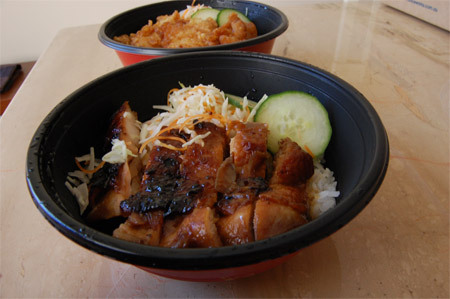 All the donburi menus such as katsu-don (deep-fried crumbed chicken on bed of rice) and ginger beef donburi are $8.50, except for three items : salmon donburi, unagi donburi and teriyaki salmon donburi which are all at $12.00. This time I ordered teriyaki chicken and teriyaki fish to take advantage on their special campaign, but I would like to try their noodle menu on my next visit. 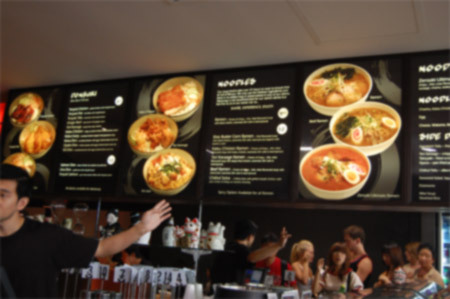 The pictures on the menu board looked delicious, especially “Zensaki Ultimate Ramen” . This Zensaki ultimate ramen noodle contains charsiu, karaage, fish cake, boiled egg etc, and you can chose the flavor of the broth – shio, miso or shoyu (soy sauce). Other ramen menu are also tempting such as shio butter corn ramen (ramen noodle in salted broth with butter-sauteed corn) and katsu chicken ramen. The price is around $12.00, and the ultimate ramen noodle is around $15.00, if I remember it right. I planned to stay home all day on the first day of this holiday, as I wanted to relax and do some housework. 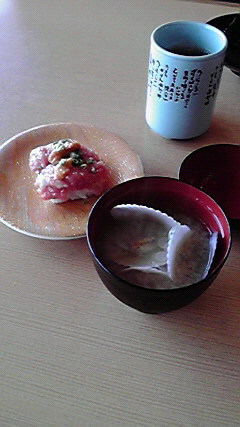 So, I invited my friends for lunch so that I could stay home while enjoying chatting and watching DVD. 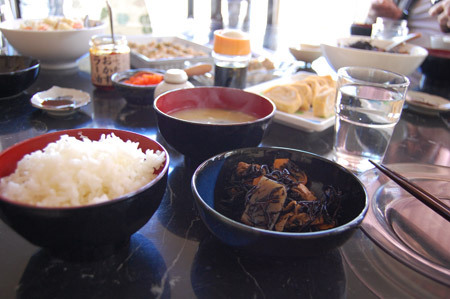 I cooked some Japanese food for them, including hijiki – a kind of black seaweed – which I brought from Japan. 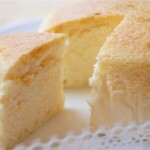 It is really shame that you can’t buy hijiki here as it is prohibited to import from overseas for commercial sale purpose. Wholesalers here can’t have this product, so you have to buy it in Japan and bring it here for personal use by yourself. Anyway, I cooked simmered hijiki with other vegetables, dashimaki-tamago (Japanese style seasoned omelet), tofu with miso-negi-chicken, miso soup and potato salad. 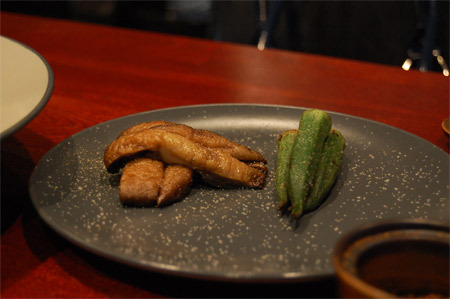 ( I will post the recipe of miso-negi-chicken later) I also had unagi kabayaki (teriyaki-grilled eel). On the second day I headed to the city. I wasn’t sure if the shops are open, but tried anyway. There’re many people walking around the pedestrian malls and sitting back at the cafes, but most of the shops were closed. It was after the veterans’ marching parade, but I could still feel the atmosphere. Many pubs were filled with people. 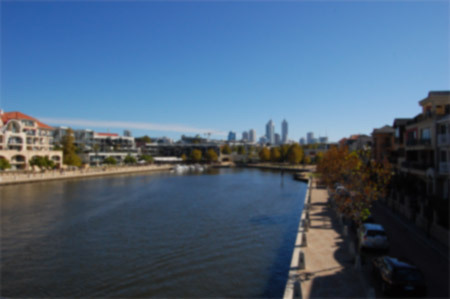 After walking around the city I moved to East Perth – one of my favorite walking spot. The last day is my relaxing day again! I woke up early and had a little walk at the park near the house. These days the sun starts to set around 6pm, which indicates that it’s already autumn and heading to the cold winder days. I hope we have more days like this – fine weather- before the rainy season starts! 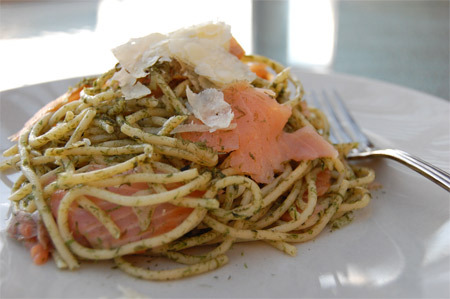 Very simple pasta with smoked salmon and ao-nori. 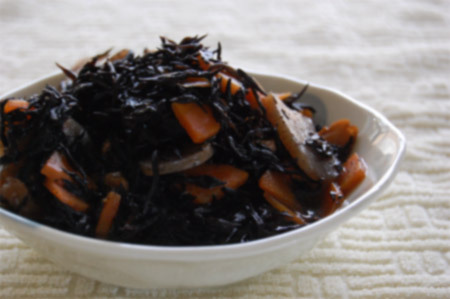 Ao-nori, also known as green laver, is dried and powdered green seaweed and it has distinctive flavor. 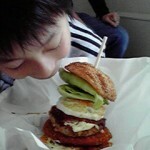 You should have seen it as a topping on Okonomiyaki, Takoyaki and other Japanese dishes. This goes well with smokey salmon and mild Parmesan. Bring a large pot of water (salted) to the boil. Cook pasta to al dente. Meanwhile, chop onion and garlic. Heat olive oil in a frying pan, and sautee garlic and onion until fragrant. Add margarin, then smoked salmon, drained pasta and ao-nori. Mix through gently, and season. Turn off the heat. Serve on the plate and top with shaved Parmesan. 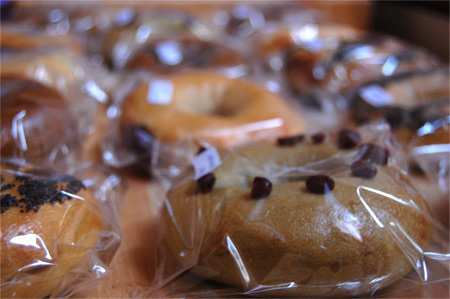 * Bagelier bagels are individually wrapped and delivered. 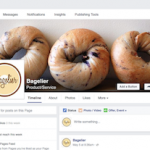 * Wrapped bagels are stored in a freezer bag, tightly closed, and kept in the freezer. Take out from the freezer. Leave outside to defrost, or microwave. Slice in half. Sandwich some food (eg: ham, cheese etc), and toast using a panini press, or sandwhich grill. Or, slice in half, toast using a bread toaster. Enjoy with your favorite spread. Take out from the freezer. 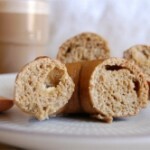 Microwave for 30~35 seconds. Toast using a panini press, or sandwhich grill. This weekend was a quiet one for us, as my husband’s friend and his family flew back to New Zealand on Saturday morning. After they left, I realised how quiet it was at home. With them and a 2-year-old boy, there were always noises and something going on. (many cleaning involved!) Now, sitting on the sofa in our living room by ourselves, we suddenly forget what we used to do on weekends. Very quiet, it should be a good thing, but I miss them already. 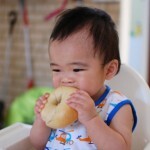 Oh, while they stayed in Perth, the most difficult thing was to think what to feed this 2-year-old boy. He is actually allergic to egg, and he is super fussy about food. 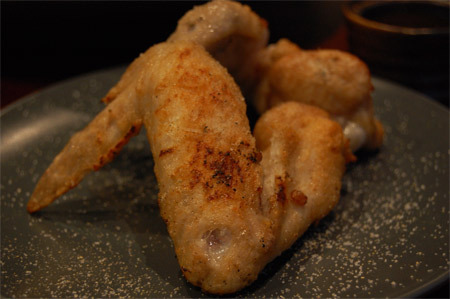 For example, he eats cooked chicken unless it is cut according to fiber. He eats steamed rice if it’s little dry and hard, but he spits out if it’s too soft. Watching the parents scolding the kid did scared us off (foresee of our future :p ) … and made us admire them for doing this everyday. 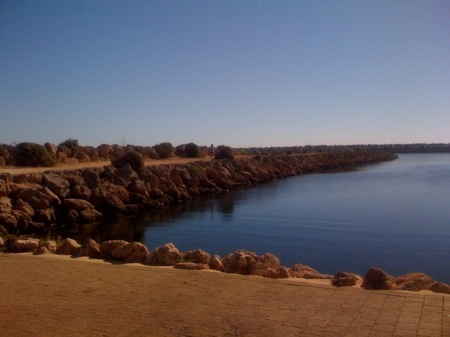 The other day we took them to Fremantle and wondered around the cappuccino street. 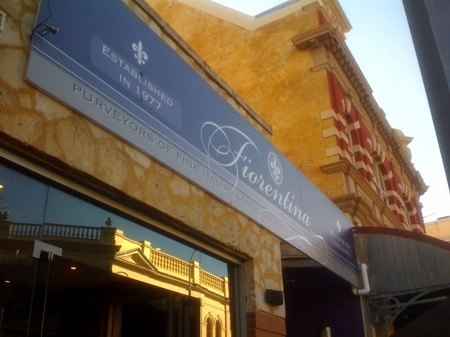 It was such a warm day, and we decided to have some drink and gelato at Cafe Fiorentina. 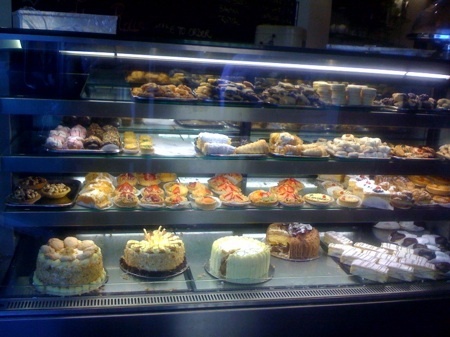 The pastries arranged inside the showcase looked so delicious. We ordered some pastries, drinks, and gelato. The boy started to scream even louder. We were quietly thinking “oh no… it started again”. Then, the owner-looking staff kindly gave a scoop of sorbet to the crying boy! The parents were surprised and took out the wallet to pay for the sorbet, but the staff said “don’t worry about it”. He is such a nice person… A crying boy became a happy boy thanks to him. I made a booking just in case, but there were few empty tables inside. The owner (whom I spoke on the phone to make a booking) prepared a window-side table for us 🙂 The place was little small, but enough to enjoy drinks and tapas! The staff were very friendly. 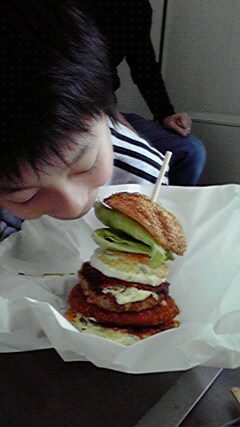 Unfortunately I had a big lunch on the day, so I wasn’t really hungry. So was my friend. 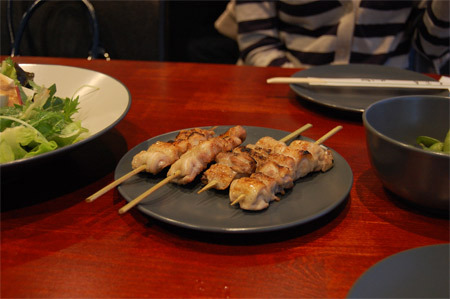 We started with edamame, assorted 7 kinds of yakitori plate, and tofu salad. 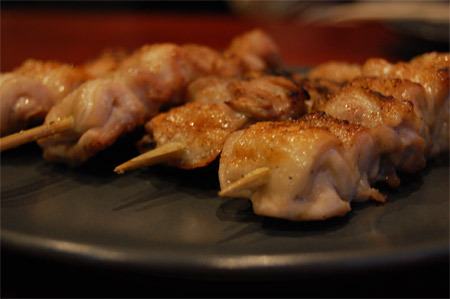 You can also order small dish of a la carte menu such as tsukune (skewered chicken meatball), mushroom, tebasaki (chicken wings) and ika no ichiyaboshi (semi-dried squid – a typical food to be eaten with sake, sho-chu and beer in Japan). We weren’t sure if we could eat some of their main meal such as teriyaki plates and oyako-donburi, those 3 dishes we ordered seemed pretty enough for us. I thought it would be nice if they had some light meals on their menu such as “ocha-zuke” (a dish in which hot tea is poured over cooked white rice topped with a few simple ingredients. It is a deceptively simple yet extremely tasty), soba noodle (either cold or hot) and yaki-onigiri (grilled rice ball brushed with soy-based tasty sauce). I received a letter from a former student of mine whom I used to teach English in 2005. 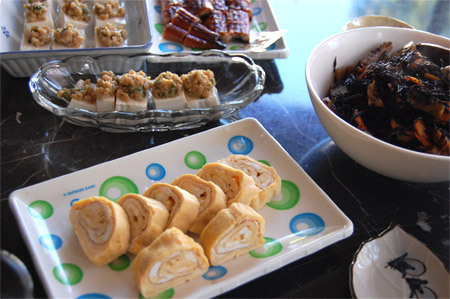 I was in Japan that time to stay with my family after graduating cookery school in Perth. 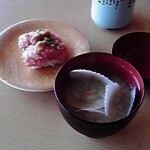 I wanted to work while I was in Japan to yearn some money as well as to gain experience in cooking. I got a job at a hotel as a cook in the bakery department and it was pretty busy (and super strict environment), but I also wanted to do something related to English. 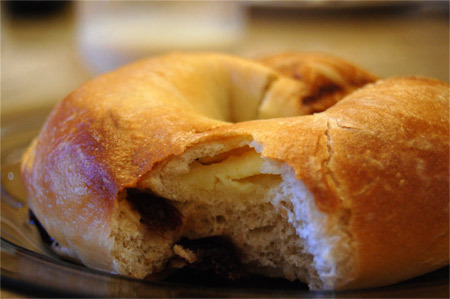 I started a kids English teacher job shortly after starting the job in the kitchen. I wasn’t planning to be such a busy person as it was supposed to be my home-coming holiday and was going to stay in Japan for only up to 8 months. 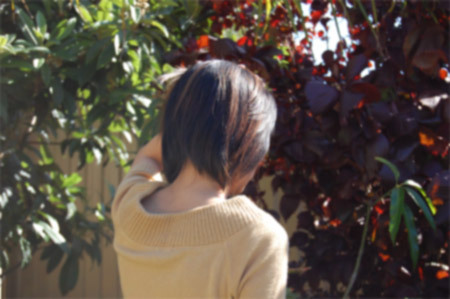 My husband (boyfriend that time) was in Perth and I felt guilty leaving him, but I really wanted to be in Japan as I couldn’t go back to Japan often while I was a student at TAFE. 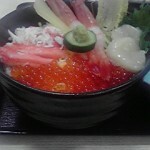 During the period, I bought a car (you will need a car to live in Shiga) and worked everyday. Plus, I had to – … well, I wanted to – cook dinner for my family everyday as my parents were divorced just a while ago and there’re only my dad, bro and grandma at my house. It was busy, but I felt good being with my family 🙂 The job as an English teacher for kids was totally new thing to me. I never thought I would be a teacher! But there was an opportunity and I thought I would try. I’m not a “kids” type of person and I didn’t really know how to be with kids, but I tried and I had such wonderful experience. The letter I received was from Kiryu, who was 6 years old back then. The letter was saying that they no longer live in Shiga, are now living in Hakodate city in Hokkaido. His mother and I were pretty close too, and they sent me some photos. 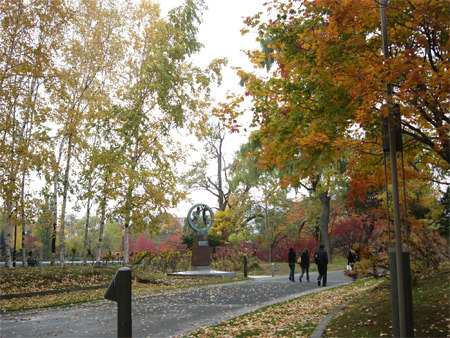 Oh my gosh, Hokkaido is such a nice place – I’ve been to Sapporo city (the capital city of Hokkaido) with my family once, and I loved everything… the atmosphere, food and the climate.